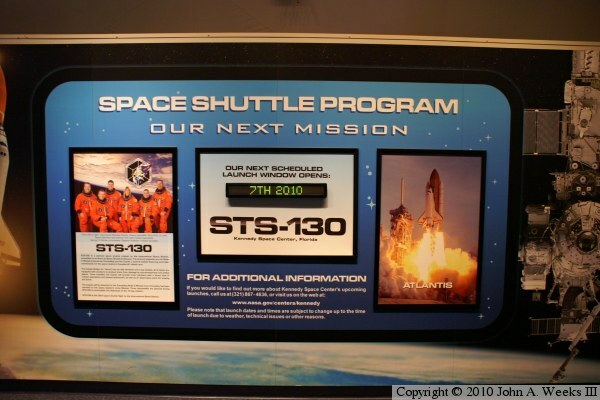 Our photo tour of the launch of Space Shuttle OV-105 Endeavour on the STS-130 mission begins at the Shuttle Information Center at the KSC Visitor Center. This photo is the shuttle status board, which is indicating that the launch window for STS-130 opens on February 7, 2010. This mission will carry the Tranquility module and the Cupola to the International Space Station. STS-130 is expected to be the last night shuttle launch and the first of the final 5 planned shuttle flights. A shuttle flight starts here at the Vehicle Assembly Building. Standing 525 feet tall, it is the largest single story building in the world. Endeavour was serviced and prepared for flight in bay 2 of the nearby Orbiter Processing Facility. 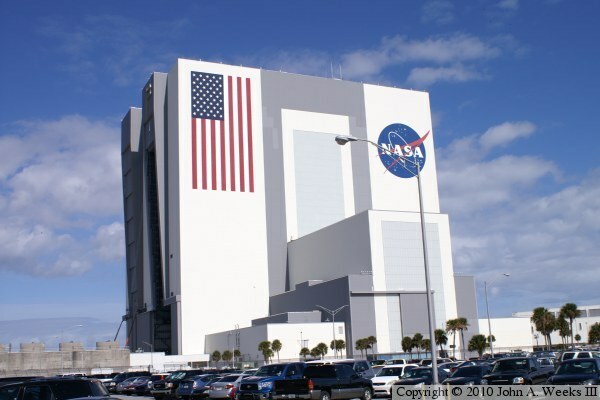 It was moved to the VAB bay 1 on December 11, 2009. Endeavour was then mated to an external fuel tank and two solid rocket boosters to form a shuttle stack. If you look closely, you can see that the tall door is open on one of bays of the VAB. NASA was preparing to move the launch tower for the Constellation program into the building. The shuttle stack is much shorter than either the Saturn rockets or the Ares rocket, so these doors are rarely opened this far. In fact, this might have been the first time that this set of doors have been opened this far since the 1970s. 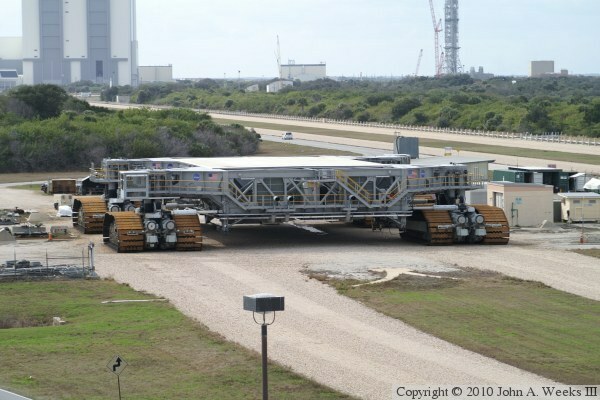 This is the crawler-transporter that carried the shuttle stack out to launch pad 39A. Endeavour was rolled out of the VAB on January 6, 2010. The 3.4 mile trip to pad 39A took just shy of 6-1/2 hours. Built in 1965, the two crawler-transporters remain the largest self-powered tracked vehicles on the planet. They move just 42 feet on a gallon of fuel. The photo above is the crawler path leading to launch pad 39A. This location is just east of the point where the crawlerway to pad 39B splits off to the north. The crawlerway consists of two parallel 40-foot wide lanes separated by a 50-foot divider. The lanes are built from several different layers of material 8-feet deep topped by 8 inches of gravel from the Tennessee River. 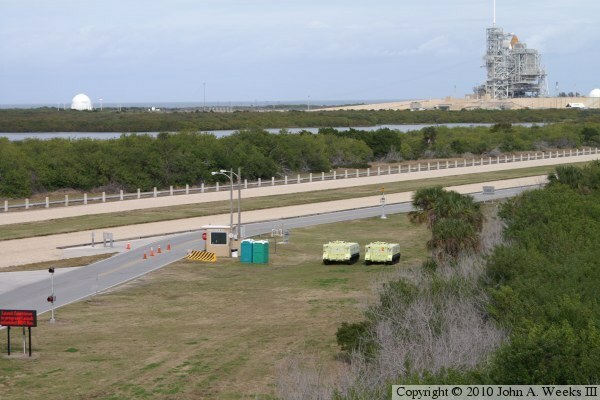 The two green vehicles sitting by the security checkpoint leading to pad 39A are M113 armored personnel carriers. NASA has four APCs. Vehicles #1 and #2 are pictured above. Vehicle #3 is sitting at the launch pad to be used for crew escape in the event of a launch problem. Vehicle #4 is 1/2 mile to the north at the security helipad to be used by a chopper crew and EMTs. 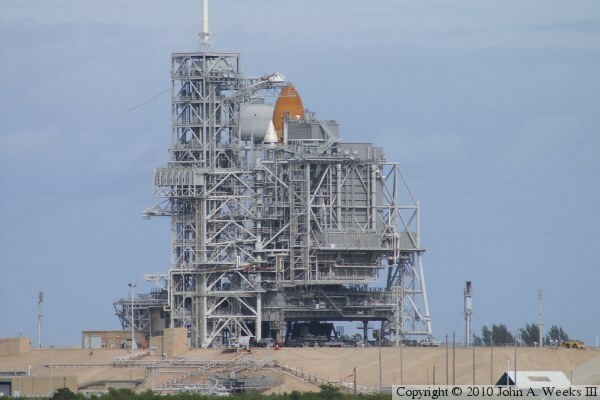 This is Endeavour sitting on launch pad 39A as seen from the complex 39C viewing gantry. The gantry is 6,400 feet (1.2 miles) west-southwest of pad 39A. The top of the external tank (brown) and a solid rocket booster (white) is visible. The shuttle is in front of the tank and boosters in this view, but is totally obscured by the rotating service structure. The RSS wraps around the shuttle to provide a clean room for installing cargo into the vehicle. 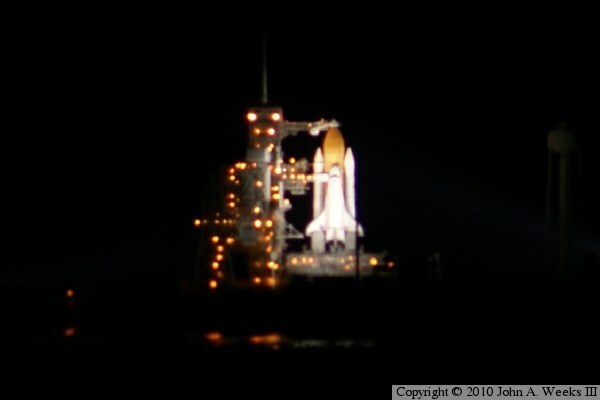 The RSS is rolled back away from the shuttle about 18 hours prior to launch as part of the pre-flight close-out. 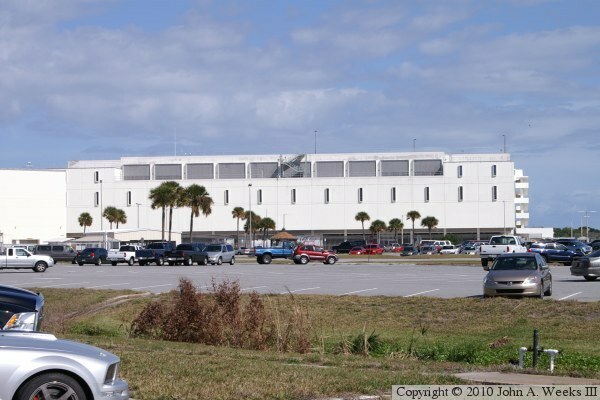 This building, located next to the VAB, is the Launch Control Center. 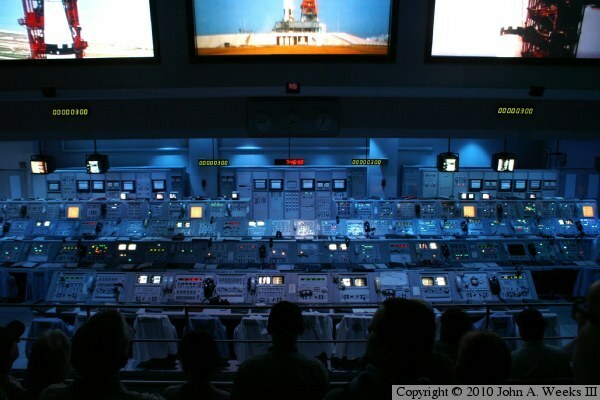 It contains the firing room where the shuttle launch is initiated. Crew families are allowed to watch the launch from the top of this building. The press and VIP viewing area is located across the street from the LCC. This is the closest launch viewing site available at just over 3 miles from pad 39A. This is a replica of the firing room that is part of the tour at the Saturn V Center. The room layout is the same as the real firing room. This equipment was used to launch the Saturn rockets in the 1960s and 1970s. This is the view of launch pad 39A from the parking lot of the VAB. The tents and bleachers are part of the VIP viewing area. Pad 39A is just over 3 miles to the east of this location. Note the eagle nest on the light pole just to the left of the water tank. The tiny white dot at the top of the nest is the head of an adult eagle tending to several chicks in the nest. I was able to obtain a causeway viewing pass for the STS-130 launch. This area is located on the north side of the NASA Causeway over the Banana River that connects between the Kennedy Space Center and the Cape Canaveral Air Force Station. 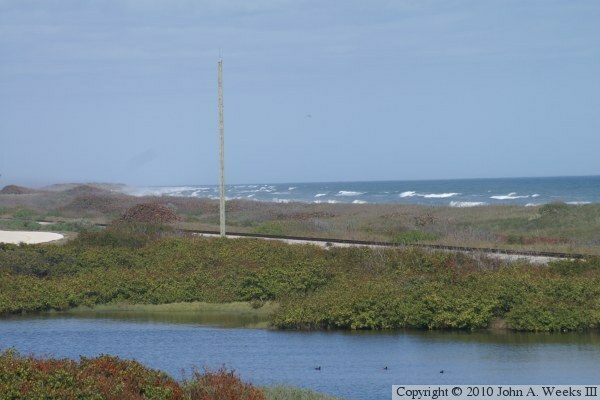 This location is 6-3/4 miles due south of pad 39A, making it the closest viewing location available to the public. At one time, the public could request vehicle passes to drive out to the causeway for launch events. However, since 9/11, access is available only by bus from the visitor center, and it requires going through several layers of security. This is the view of launch pad 39A from the NASA Causeway viewing area. The pad is nearly 7 miles away. The shuttle is on the near side of the stack, but is obscured by the Rotating Service Structure. The water tower near the pad is part of the launch pad sound suppression system. It holds 300,000 gallons of water, plus there is another 100,000 gallons of water in the piping system. This water is dumped onto the pad within 21 seconds starting at T minus 6 seconds. Without this water dump, sound waves would bounce off of the pad and destroy the shuttle before it clears the launch tower. This is a view of the Atlantic Ocean from the USAF camera platform located northeast of the launch pad 39 complex. Note the rough surf and the high waves breaking along the shore. High winds were a concern in the days leading up to the launch. The winds were routinely gusting from 10 to 25 miles per hour. The shuttle has a launch rule set at 22 miles per hour. This is to prevent winds from blowing the shuttle into the launch tower at lift-off. Wind is also a concern for sheer stress on the stack in flight, and for any difficulty in landing the shuttle on the nearby runway in the event of a launch abort. This is the Endeavour shuttle stack as seen from the USAF camera platform located 5,000 feet (just short of mile) to the northeast of pad 39A. 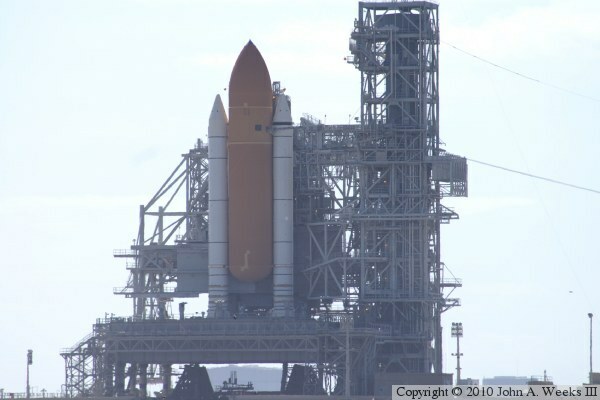 This is the closets public view of the shuttle when it is on the launch pad. The orbital vehicle is on the far side of the stack giving us a view of the external tank and solid rocket boosters. This view is looking directly into the bright midday sun. The sun is low in the sky during February, making photography from this location even more challenging. The shuttle launch experience starts here at the Kennedy Space Center Visitor Center. The visitor center was up and running all night long. You could watch the launch from the visitor center, from the astronaut hall of fame, or, if you had a causeway pass, you could board a bus to head out to the causeway viewing area. There were video screens set up at the center for NASA TV, public affairs audio was piped in, and officials held hourly status briefings. 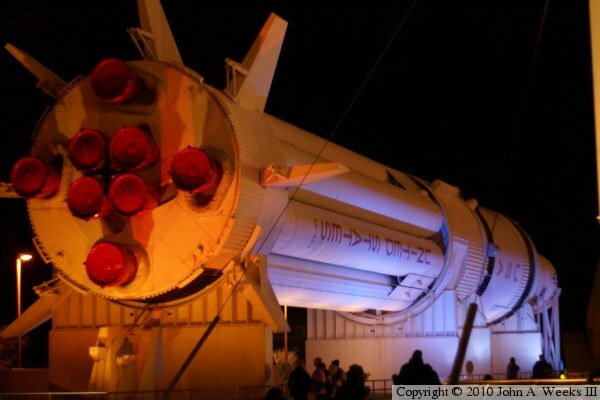 The viewing area was located between the IMAX theater and the rocket garden near this huge Saturn IB rocket. The Saturn IB boosted several Apollo flights into orbit including Apollo 7, Skylab 2, Skylab 3, Skylab 4, and the final Apollo flight called ASTF. 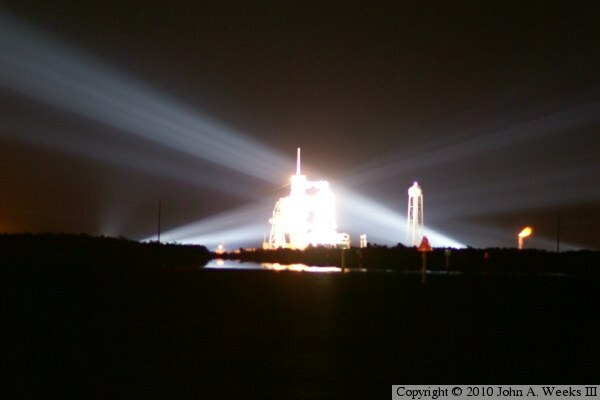 This is the view of the shuttle stack on launch pad 39A on the morning of February 7, 2010. 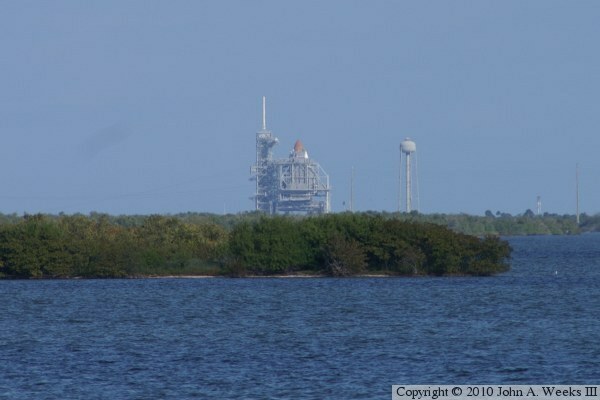 The vantage point is the NASA Causeway over the Banana River located a bit less than 7 miles due south of the pad. Most of this distance is over open water, followed by a swath of trees. The pad structure is elevated making the stack visible above the treeline. I intentionally overexposed this photo to highlight the beams of light that are illuminating the launch pad. 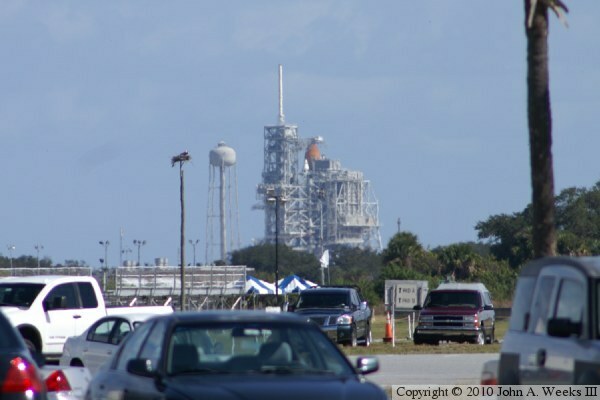 This is a another view of Endeavour sitting on launch pad 39A only minutes before the first launch attempt on February 7, 2010. This is our first view of the orbiter given that the RSS has been rolled back out of the way. The launch odds were given at 70% in the days leading up to the first lift-off window due to high winds. That was upgraded to 80% the day before launch. 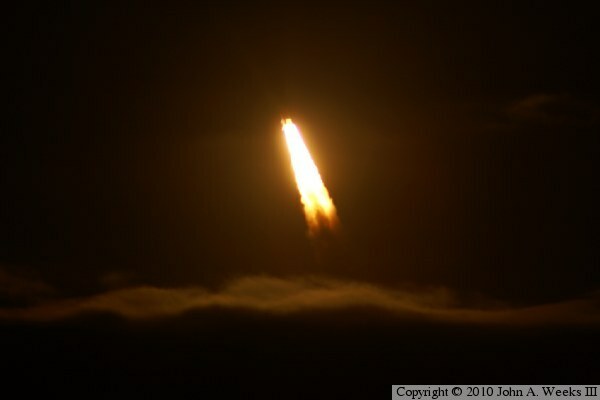 However, a bank of clouds started to roll in the night of the launch. The odds were given as 65% at 9PM, then 50% at midnight, and 35% at 2AM. The countdown continued to the built-in hold at T minus 9 minutes. The conditions were cycling between go and no-go every 5 minutes or so. NASA called a scrub at the end of the built-in hold at 4:30 AM. Shortly after calling for the scrub, NASA suggested that they might try again on Monday morning at 4:14 AM. The weather forecast was not favorable, nor was it looking promising for Tuesday. Conditions improved throughout the day on Sunday. NASA announced at 6:30 PM that they had decided to start filling the fuel tank on Endeavour, an activity that would take 3 hours and cost $500,000. That is generally a sign that the weather models are looking favorable. As launch time was nearing, there was a cloud deck, but it was rapidly thinning out and breaking up. Then an issue developed at the transatlantic abort site. But when NASA reached the end of the built-in hold at T minus 9, everything was looking good. 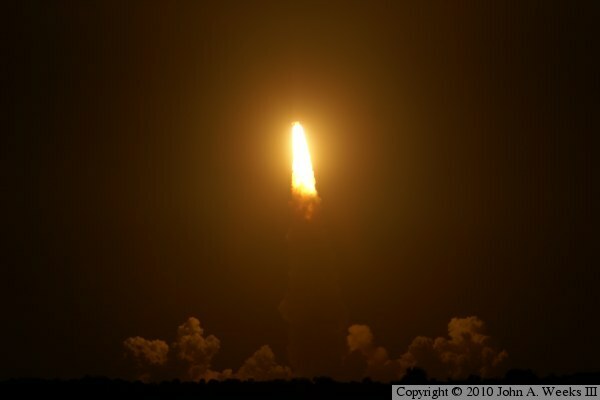 Lift-off occurred right at 4:14 AM. The shuttle flame is about 1,000 feet long, putting the stack about 3,500 feet above the ground in this photo. Night photography requires patience, often involving taking several shots using different settings in a process called bracketing. The key is using a tripod and doing longer exposures. That is difficult in this case because the shuttle is moving so fast that it would quickly move out of the view finder. In addition, the movement would cause a blurry photo. Distance shots are even more difficult because the lenses have higher F-numbers and need longer exposures. Finally, there is no way to practice this in advance—you only get one shot at the event. All of these photos perhaps could have used a little more exposure. The smoke cloud shows up well in the photo above, but there wasn't as much light in this photo to show the smoke cloud to its best advantage. There was a layer of clouds at about 5,000 feet. In this view, the shuttle has punched through the clouds and is starting to arc over to the northeast. 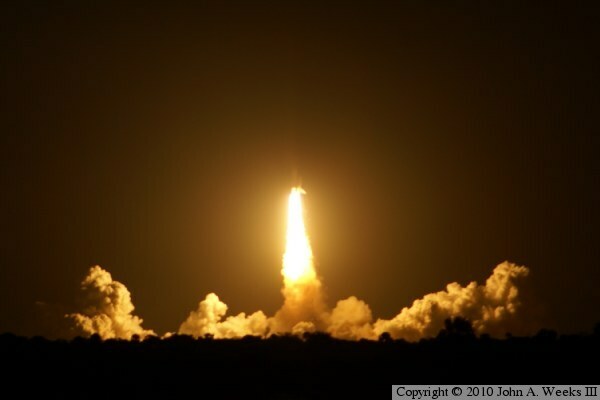 These launch photos were taken from the Indian River causeway just north of downtown Titusville. I was parked at the wildlife refuge fishing pier, and I walked across the causeway onto a dike that was built to support a bridge construction project. This location was 11-1/2 miles almost due west of launch pad 39A. 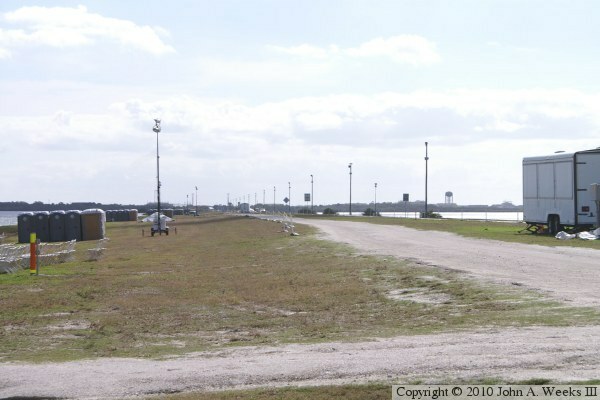 Assuming all goes according to plan, Endeavour will land at the Shuttle Landing Facility on or about February 20, 2010. 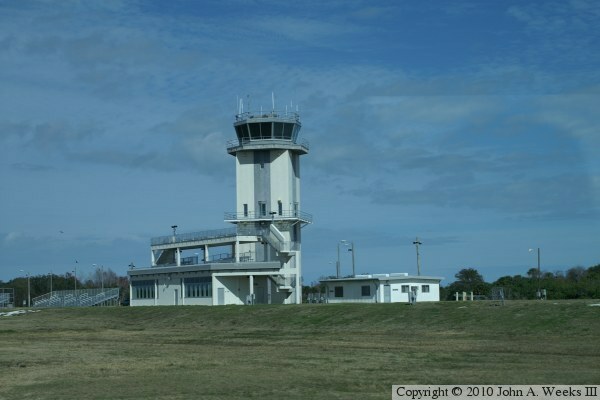 This photo is the air traffic control tower at the shuttle landing strip. While the public is not invited to watch shuttle landings, this building has several decks for family members, space program officials, VIPs, and media. Also note the viewing stands set up on the far side of the building.